There’s all kinds of good news about Sarasota, Fla. in the news lately. End of year stats show that 2012 was the 4th best year in sales numbers in the last 90 years! Our market has rebounded nicely with 9,169 total sales for 2012 topped only by 2003, 2004, & 2005 with 2004 being the all-time highest sales volume at 11,267 total. December 2012 sales were at 828 properties showing an 8.3% increase from November 2012. Home prices in Sarasota and Manatee counties rose 12.2 percent in November over the period in 2011, according to Core Logic Inc.
Sarasota was named one of the 100 Best Communities for Youth by America’s Promise Alliance. A Penske Truck Rental report cited Sarasota in the top 10 cities people were moving to. Our local college scene news continues with 5 star reports about our New College of Florida ranking ninth in the US for the percentage of students who go on to graduate programs within a year of graduation. U.S. News & World Report published the finding online January 2 in its ongoing series The Short List, which explores the data collected for its annual Best Colleges issue. All good reasons why Sarasota is a destination for families from everywhere. 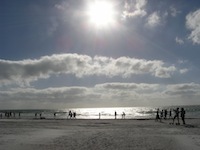 Not to mention the glorious weather, beaches,sports events and cultural experiences that Sarasota has to offer. People com to visit and return looking for a second home or looking to relocate because of the endless list of amenities in this area. It’s paradise and the price of paradise is going up. The new stats released show the median home sales price for condos and single family homes is $175,000. This is a 13% increase from 2011.